In 1982, the Fédération Internationale de l’Automobile (FIA) Formula 1 World Championship was in its second season, having being created when the original Championnat du Monde des Conducteurs set up in 1950 by the Commission Sportive Internationale (CSI) was terminated by the FIA at the end of the 1980 season thanks to what might politely be considered a serious fit of pique. Thanks to the discontent on the part of several teams that had been simmering since the 1960s finally bubbling over in the latter part of the Seventies, the self-proclaimed Pinnacle of Motor Sport seemed to have degenerated into an endless series of nasty Handbags-at-Dawn skirmishes. Simplistically, it was the gallant British teams against the dastardly Continental Powers. It was, of course, a bit more complicated than that. In 1978, the CSI, established in 1922 by the Association Internationale des Automobile Clubs Reconnus (AIACR, which is what the FIA used to be called pre-World War II) as its means to oversee international motorsport, was renamed and reorganized as the Fédération Internationale du Sport Automobile (FISA). This was thanks to Jean-Marie Balestre becoming president of the CSI. He was a founding member of the both L’Auto-Journal and the Fédération Française du Sport Automobile (FFSA) in the early 1950s, becoming president of the FFSA in 1972. In July 1968, it was the FFSA and not the Automobile Club de France (ACF) that sanctioned the world championship race held at Rouen-les-Esserts, ending the Grand Prix de l’Automobile Club de France, dating back to 1906, and replacing it with a new event, now simply called the Grand Prix de France. Balestre was something of an autocrat, serving during World War II as a member of the French SS—later claiming that he was actually an undercover member of the Resistance. Few took this assertion very seriously, however, especially considering that his L’Auto-Journal cofounder Robert Hersant had actually been a genuine collaborator who made no bones about probably being the only Frenchman not to have been a member of the Resistance, an amazing feat. As one of those responsible for wrenching away the Grand Prix de France from the ACF and now part of the leadership of the organizing club for the event, Balestre did not take kindly to the way that British teams and their lobbying group, the Formula 1 Constructors’ Association (F1CA, organized in early 1964) went about it business. Britain had been more or less part of the backwaters of motorsport since its inception, with the exception of the odd moment here and there. It was insular, literally and figuratively, and more than a tad parochial. During the 1950s Britain began to gain success in international (meaning Continental and, maybe, North American) motorsport. Victories by Jaguar and then Aston Martin in the Grand Prix d’Endurance, the 24-hour race at Le Mans, followed by successes by Vanwall, Cooper, and then Lotus created a seismic shift in motorsport, the center of the motorsport universe now becoming Britain, not Italy or France or Germany, and certainly not the United States. Success by the British was accompanied by the sort of arrogance and obliviousness that harked back to the days of Imperial England. Once at the top, British teams were not only determined to stay there, they began to regard it as their right to rule the sport as well. Enzo Ferrari and his team were, grudgingly, accepted as an exception to this Anglicization of the sport: arrogance recognizing and tolerating arrogance elsewhere within the confines of the sport. During the 1970s, international motorsport in the form of Grand Prix racing was rather cosmopolitan when it came to drivers, something which it had long tended to be, but the British teams still tended to be the bulwark of the sport, Ferrari remaining the primary Continental adversary of the Islanders. That the commercial—financial and business—aspects of motorsport in general and GP racing in particular had changed dramatically since the 1950s began to become a major sticking point between the teams, overwhelmingly British of course, and the organizing clubs, most on the Continent at that time, who provided the actual racing venues. Money, as they say, makes racing cars go round and round. After a series of increasingly bitter skirmishes between the GP teams and the organizing clubs during the 1970s, with the latter generally getting the fuzzy end of the stick, the conflict started to escalate. The CSI, long deemed by all involved as being pretty much a hapless, ineffectual bunch of Old Guys in Blazers—with this being a rare subject of unanimity on the part of the teams and the clubs, was seen, however, by perceptive folks as a possible means to redress the balance in at least the Grand Prix world. With the election of Balestre as the president of the CSI in 1978, the skirmishes soon begin to escalate into firefights and then into out and out war by 1980. Having witnessed the futile attempts by the organizing club to curb the British teams and the F1CA, Balestre creates the FISA to replace the CSI in 1978 and in 1980 simply ends the Championnat du Monde des Conducteurs that had been in place since the 1950 season. He made the latter move because, as it turns out, the commercial aspects of the world championship really did not belong to the CSI and the FIA. Balestre and the FISA created a new world championship, the FIA Formula 1 World Championship, which will come into being in 1981. The FISACO War, the ugly contest of wills between the FISA and the FOCA (the Formula One Constructors’ Association, the F1CA slightly renamed), with Balestre/FISA on one side and Bernie Ecclestone and Max Mosley/FOCA on the other, begins in earnest in 1979, but erupts into full-scale warfare in 1980, before settling into an uneasy truce in early 1981, one brokered by an uneasy Enzo Ferrari. An understanding, a secret close-hold document, the Concord Agreement, is signed in March 1981. As someone later observed, it was more akin to mob bosses divvying up the territory and the spoils and thereby satiating mutual greed than an attempt to resolve the actual issues at hand. Among the various battles for the world championships since their creations in 1950 and 1981, the 1982 season is often regarded as one of the most interesting and competitive, with the 1961 season being close on its heels. Sixteen events, beginning in January with the South African round in Kyalami and ending in the parking lot of Caesar’s Palace in September, encompassed a season literally fraught with peril and often confounding both logic and expectations. And, prior to the 1982 season, Christopher Hilton had never even seen a Formula 1 car prior to the Detroit race in early June of that year, much less covered a race or had much of an ideas as to what the entire scene was all about. 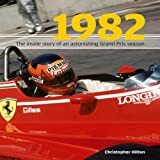 A quarter of a century later, Hilton offers a book on the turbulent and trying and pretty much bizarre 1982 FIA F1 World Championship season. While one could easily produce a book many times as thick as this one, thanks to Hilton’s knowledgeable prose and light touch when it comes to the technical side of things, in stark contrast with that of others (cf. Anthony Pritchard and Alan Henry to name but a very few who often obsess over such things), his book offers a very good narrative of what is this most unusual racing season. 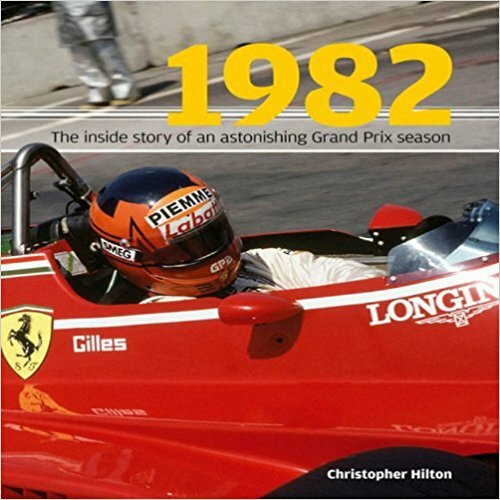 I think that 1982, along with Nuvolari (2003)* and Hitler’s Grands Prix in England: Donington 1937 and 1938 (1999) gives us a better idea as to Hilton’s strengths than the potted driver biographies he produced in seeming abundance for years. While I could certainly quibble with some of Hilton’s points in the book, I also recognize a good piece of work when I see it. In my estimation, it remains one of the best—of the unfortunately all too few—narratives of a single racing reason, Grand Prix/F1 or otherwise. Best of all, it has aged rather well . 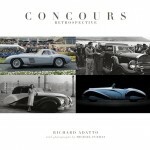 . .
Full disclosure: I worked with Hilton on the Nuvolari book, especially the material for the 1933 Gran Premio di Tripoli and the 1936 George Vanderbilt Cup. Copyright 2017, Don Capps (speedreaders.info).